Championship side Bolton are conducting an internal investigation after a newspaper published allegations about manager Neil Lennon. It was alleged in the Sunday Mirror the 44-year-old former Celtic boss made a threat to somebody he was said to be romantically involved with. The paper also claimed Lennon tried to ban them from publishing the article. The report adds the ex-Northern Ireland player made a blackmail allegation to police but did not want to pursue it. 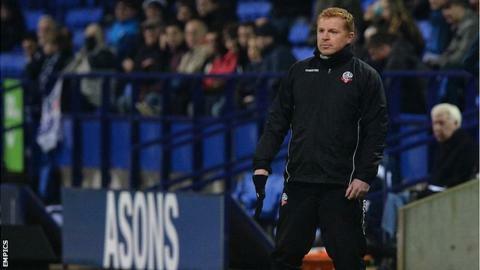 BBC Sport contacted Bolton for comment from both the club and Lennon. A spokesperson said the manager was unavailable and that they had nothing more to add to their statement, which read: "In response to an article published in the Sunday Mirror on Sunday, 20 December, Bolton Wanderers can confirm that the club are currently conducting an internal investigation regarding the matter concerned." As things stand, Lennon will be in charge of the Trotters' Boxing Day Championship fixture at Rotherham. The league's bottom side are £172.9m in debt and received a winding-up petition for about £600,000 in unpaid taxes.